In reaction to the recent Al Jazeera coverage of Kuwait political troubles (see here) the Kuwaiti Government has closed down their offices in Kuwait City. Al Jazeera are used to this. They have their offices shut down across the region from time to time. Typically, the Kuwaiti Emir will make a plea to the Qatari Emir, imploring him to get Al Jazeera to tone down their coverage. The Qatari Emir will insist that he has nothing to do with it. A few weeks or months later and after the dust has settled, the office will reopen. There are two other possibilities, as I see it. First, Kuwait might seek some kind of Saudi-eqsue agreement. Al Jazeera had a well deserved reputation for its harsh and somewhat salacious coverage of Saudi Arabia. This was at the time of generally poor and fractious relations between Qatar and the KSA. In agreeing to return a Saudi Ambassador to Doha for the first time in four years in 2008, Riyadh demanded that Al Jazeera’s coverage be toned down towards them, and so it was. There are rumours of a similar deal being done/worked out between Qatar and Egypt at the moment. The problem for Kuwait is that they do not really have any leverage over Qatar. Their relations are OK generally; nothing really leaps to mind: there is no great reason for the Qatari government to acquiesce to a similar deal. The second (related) possibility is that perhaps Kuwait might seek to form a quasi-coalition against Al Jazeera and Qatar. If they can get Egypt and say, Bahrain, on board – both with antagonistic relations to Qatar – then perhaps momentum will help them attract more countries to make a joint threat: ‘tone down Al Jazeera’ or we’ll all close our offices. 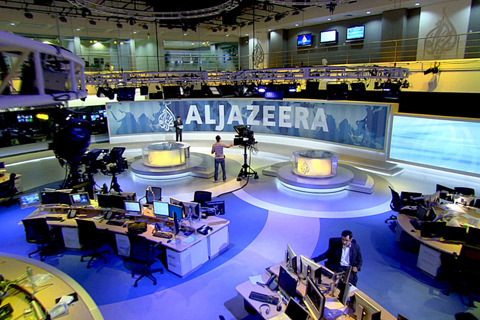 It’s not as if all Arab countries will not be tempted to try to punish Al Jazeera. It is also worth pointing out that this may not be well received in Kuwait. I would suspect that for the opposition in Kuwait, Al Jazeera is well-regarded and thought of as a useful megaphone for their views. ‘Once again’ they may well moan, ‘the Government is trying to stifle us’. None of this bodes well for the resumption of the relatively pliant and cooperative politics of recent months. Nice column. I find Kuwait’s actions troubling. As few as 6 months ago, I heard Kuwait described as one of the best countries in the Mideast regarding press freedoms. This is clearly no longer the case.